Keratin hair smoothing treatments have been a Godsend for women with unruly hair who dream of sleek strands. But how you care for your hair -- including how long you wait before getting it wet -- in the days following the treatment will affect the longevity of your new ‘do. Keratin hair smoothing treatments involve covering the hair in a hydrolyzed keratin solution and bonding it to the cuticle with a flat iron set at 450 degrees Fahrenheit. To ensure the best results, you can’t get your hair wet for 72 hours after completing the treatment. That means no shampooing or swimming. You also should avoid making any impressions in your hair with accessories such as clips, ponytail holders, hats or sunglasses during the first few days. Results may last up to five months. Newer express keratin smoothing treatments take just one hour to complete, but results only last four to six weeks. The good news is you only need to wait eight hours before washing your hair or going for a swim. The Brazilian-style blowout is another type of keratin smoothing treatment which uses a polymer system rich in acai berry to create a protective layer around the hair cuticle that smooths the hair shaft. Once the treatment is brushed through the hair, hair is blown straight and straightened, locking in the style. The process takes 90 minutes. 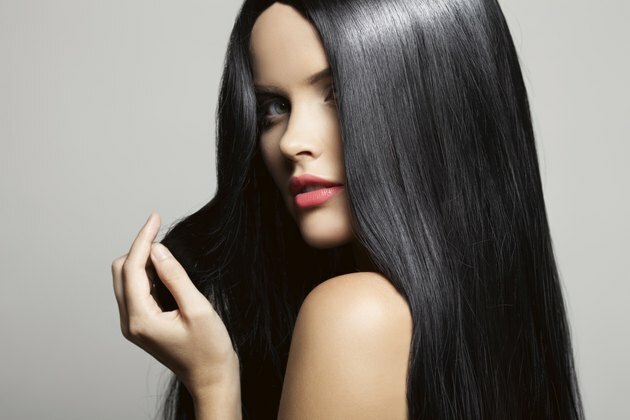 Unlike other keratin smoothing treatments, you can wash your hair and use clips immediately afterwards. In the weeks and months following a keratin or Brazilian-style straightening treatment, use a shampoo that is free of sodium chloride and sodium laureth sulfate, or SLS. These chemicals strip the keratin from the hair, impacting the longevity of the sleek look. If a product is SLS free, the package will generally say so, but you can also check the ingredients list for these chemicals. To make results last, it's best to limit washing your hair to two to three times a week after you receive the treatment. If you're an athlete who washes your hair more than once a day, results won't last as long. For instance, an express blowout that would normally last six weeks would only last about three if you were to wash your hair twice a day.